Convert Windows Multiple MBOX files to Outlook PST/MSG/EML/NSF/HTML. Enable user to Convert and Merge various MBOX files into a single format. MS Outlook installation not required while Migration of MBOX files to . Display the Report of converting MBOX files along with their Items. Supports MS Outlook 2003/2007/2010/2013/2016 on Windows OS Platform. 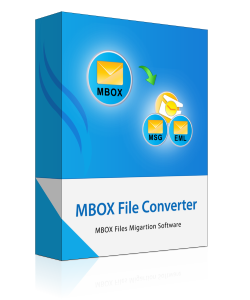 MBOX file converter tool is the only tool which migrates multiple MBOX files into Outlook PST, MSG and EML in bulk. Here user can add a number of MBOX files and these files are saved in common folder. After that the user are free to convert the entire folder at a time. Even this tool facilitates one more option, i.e. 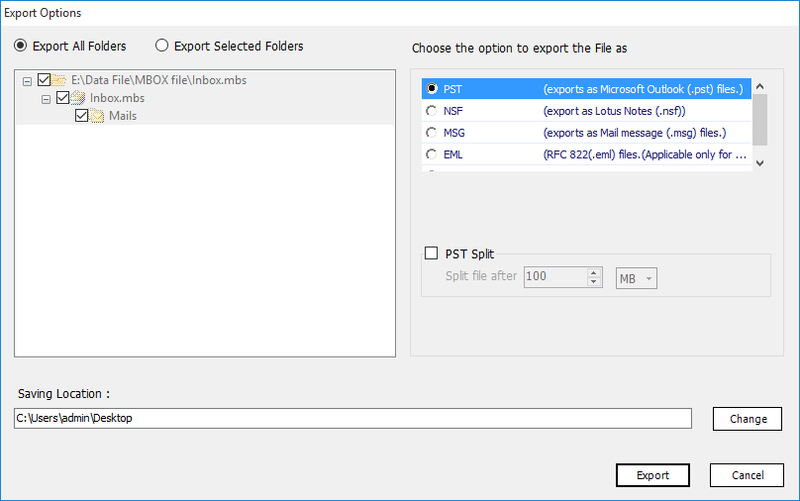 users can convert single MBOX files as a separate Outlook PST files as well as all MBOX files are merged into a single PST file. Export as PST : MS Outlook email client can use this type of file. 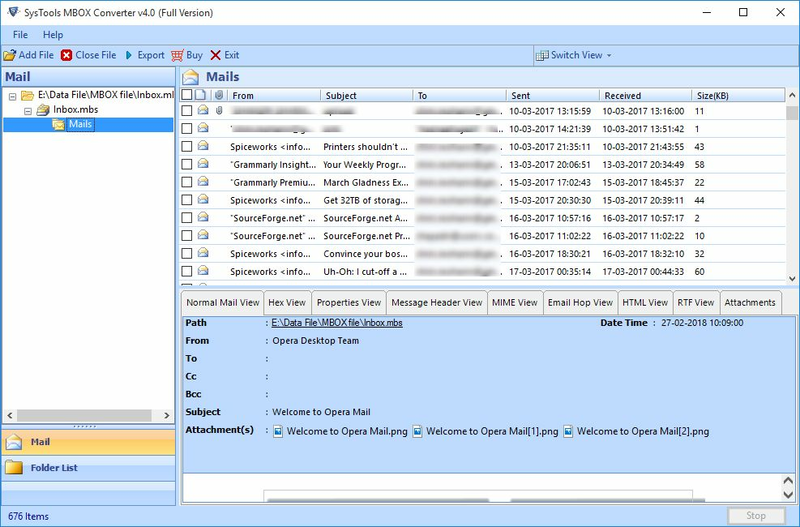 Export as EML: Desktop based email applications saved emails in .eml format such as Outlook Express, Windows Live Mail etc. Export as MSG: MSG is the email file format which is used by MS Outlook. Export as HTML: Allows to save MBOX files in HTML file format and easily viewed on any browser. Thunderbird is the email application which is very commonly used as a desktop email client to store an email data in .mbox file format. In order to migrate MBOX to PST; MBOX file converter is required and our software allows a user to accomplish the respective task. The Software automatically detects email client which supports MBOX file. Instead of browsing the file yourself, user can get the option to select the email application such as thunderbird, Eudora, PocoMail, Seamonkey, Netscape, etc. after that it can proceed to migrate its storage. MBOX email files generally use very common file format which is created by a number of email application in different formats such as : .mbox or mbx or called as MBOX files without any extension. 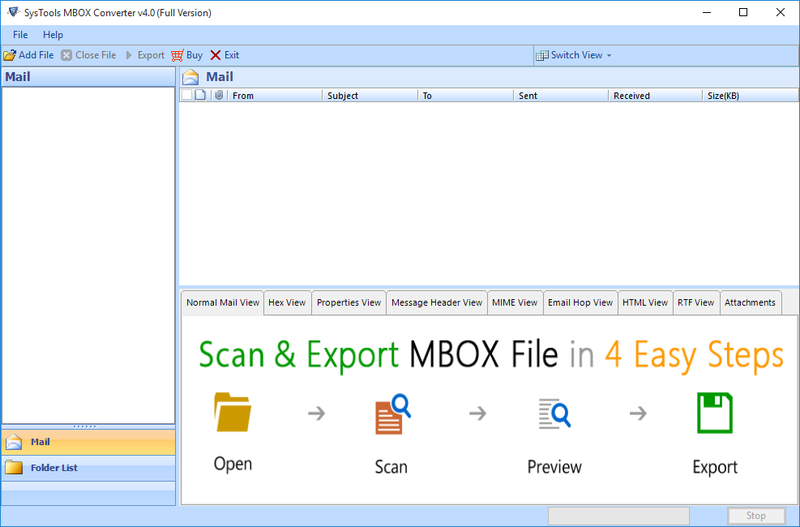 MBOX files are introduced by multiple email applications such as SeaMonkey, Apple Mail, Spice bird, PowerMail, Mozilla Thunderbird, Postbox, Evolution, Netscape, Eudora, PocoMail. In order to convert Apple Mail files into Microsoft Outlook; the user need to convert them into a file format. 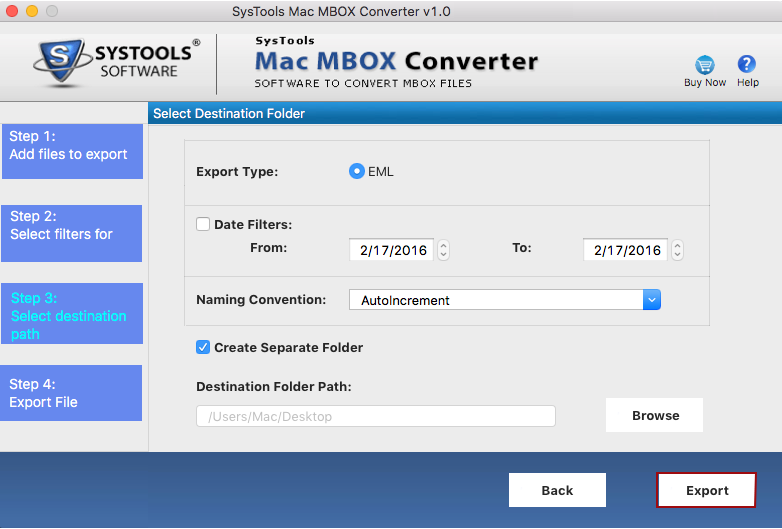 As Apple Mac mails save their data in MBOX format, user can easily migrate it into by using MBOX converter software. If you are using Eudora Mail and need to convert from Eudora to Outlook, then go for MBOX File Converter software, it will surely help you. 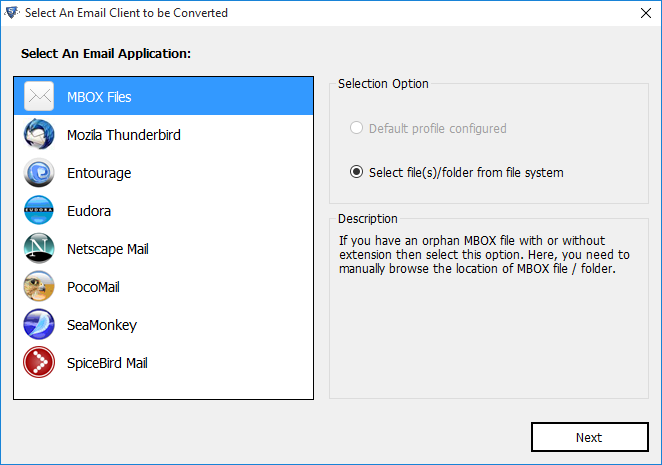 Meanwhile MBOX files created by the Eudora email application are in .mbx format which can be further converted into file format without any hindrance. Also, user can migrate Eudora mails to EML or MSG formats to further use them on different application. The tool supports the migration of MBOX file format backup of user Gmail emails, which is created by using Google takeout into . In case till now if you don't use Google Takeout to backup your gmail data and try to do it directly into through Gmail Backup Solution. The User is allowed to migrate selective emails from any MBOX file, after that it can be saved into a file format. Exporting any MBOX file would be quite easy, user only needs to select those emails and right click on it to export them into the desired file format. Even there is an option in export pane where users can check /uncheck the folders to perform export of to format. 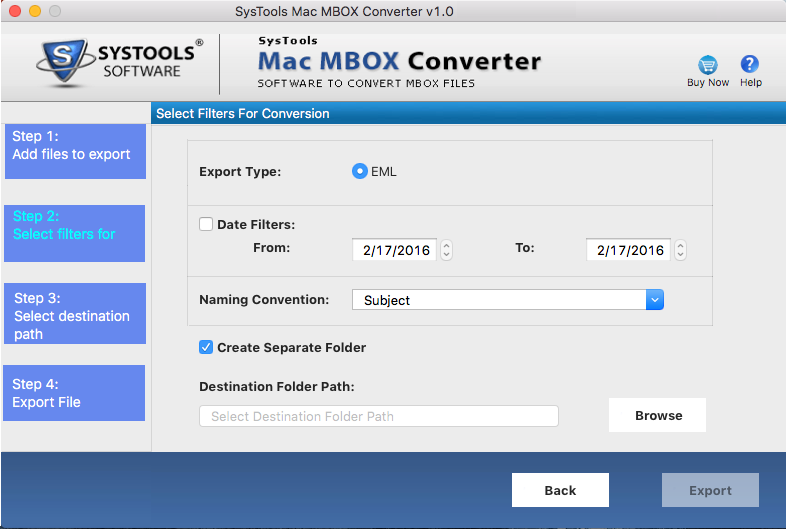 If you are exporting MBOX to EML or , then the MBOX converter tool display the option to select an appropriate naming pattern to save each email with. Software has multiple naming conventions available such as: Save as subject, DD-MM-YY, MM-DD-YY, MD5, Auto incremental and many more. The software is full of advanced set of logical algorithms that makes it possible to scan MBOX files separately after the filtration. The tool can filter Out all MBOX files for scanning from a miscellaneous types of files. The most striking feature of the software is that it provides multiple options to view the folder items of each MBOX file. Viewing any folder is very easy. Just right-click on any folder from the side panel of tree view where you will get 3 options: First one is Close all â€“ To close all MBOX files, Collapse all â€“ To close the tree view of an MBOX file and the last one Expand all which shows the folders within a filter respectively. Our software is a Windows OS friendly application which can successfully supports all the versions of Windows whether it is 34 & 64 bit and multiple processor architecture. It is easily compatible with Windows OS and provide easy to use graphical interface. Trial version of MBOX File Converter tool preview MBOX Emails & Export 25 items to file formats. Can I easily export Eudora default MBOX file to Outlook PST using the tool? Yes, You can conveniently export Eudora MBOX file to Outlook PST without loss of data using the software. How can I locate the MBOX file of thunderbird via software? You do need to panic because the software is capable of automatically detect the Thunderbird mbox file from the local storage itself. Is there any option to perform the bulk conversion of mbox to pst file? For the bulk conversion of mbox file you have to choose Export All folders option before finals step. What is the format of resultant PST file after the conversion process? The MBOX to PST Converter software follows the updated algorithmic approach to create the resultant pst file in Unicode format. It is easily be viewed using the latest MS Outlook Applications as well. Allows Batch Conversion of MBOX files to PST database file. Preserves Complete Metadata Information While the conversion process. Retains the Inline Images and HTML formatting of the MBOX Emails. Multiple Naming Conventions for proper management of resultant data after the conversion. Provide Support for Mac OS X 10.10 Yosemite and above versions. The Software provides the facility to convert selective folders into multiple file formats such as EML, HTML, PDF with attachments. To achieve this you have to use Export selected folders option and then select the folders which you to export. Convert MBOX file to PDF file format. The MBOX to PDF Converter software easily convert the mbox file format to adobe file format. The software by default creates the separate pdf file for multiple mbox file. It maintains the data integrity while the conversion of mbox to pdf. It also provides the flexibilty to its user to save the resultant pdf file at the desired location on local storage or system. Export as PST : With the Help of MBOX to PST Converter, you can easily export MBXO files to PST format. Export as EML: The EML file format is easily be viewed using the various desktop based email clients such as Outlook Express, Windows live Mail, Outlook etc. Export as PDF: The Most popular file format to take the backup of MBOX file format. The MAC MBOX Converter software is easily compatible with all the version of MAC OS and different architectur. You do not ned to worry about the compatibility issues of the software. 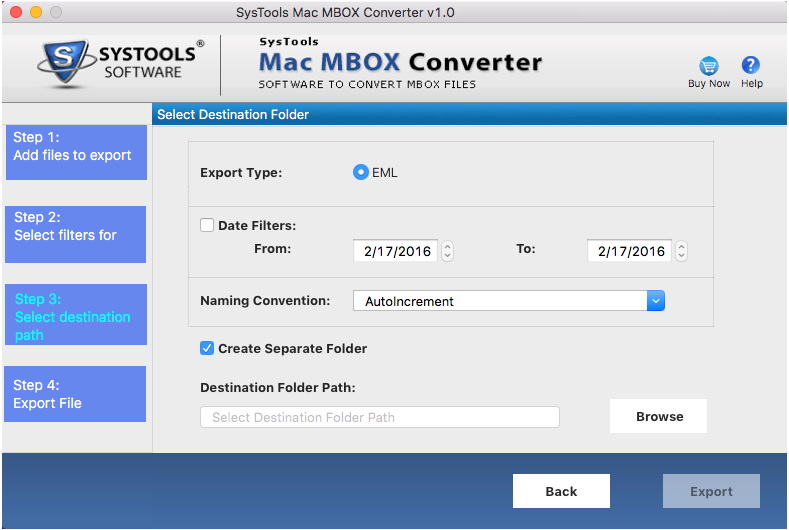 Trial version of MAC MBOX File Converter tool preview MBOX Emails & Export 25 items to PDF, EML, HTML and PDF file formats. 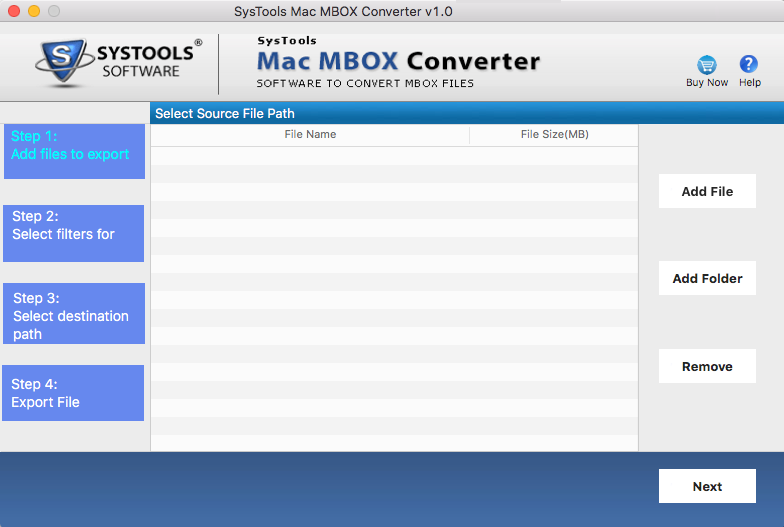 Does the MAC MBOX File Converter tool support MAC OS X 10.9 or its lower versions? Is it possible to export multiple MBOX files? Yes, you can easily export multiple MBOX files into any types of files PST, EML , HTML, PDF format. Yes, the MBOX file converter software creates the separate PDF file for each MBOX emails with intact metadata and file strcuture. I do not think it is possible to migrate the MBOX to PST file without Microsoft Outlook installation. but it is possible to with the help of your MBOX to Outlook PST converter thank you so much. I recommend to my colleagues that they should use your software. I am not such type of person I have no time to write appreciation, but the mbox file converter tool is forced me to write. It's a very good tool. I recommend to everyone that anyone who wants to convert MBOX to NSF. Use it. I need to convert mbox files into Outlook PST but I did not find any suitable software for the same. But when I read about your software. I am impressed with performance of the software. I really worked for me in converting MBOX files to Outlook PST. The MAC MBOX File Converter really help me a lot to convert MBOX files to outlook PST on MAC machine. I was searching for a MAC Compatible software that allows me to have access to the emails of MBOX file. After hours of research, I found REVOVE MAC MBOX file converter. I deeply appreciate the efforts of REVOVE Software's. I am working on MAC OS from the past few years and I don't want to get switched over windows but when I have an urgent need of email residing into MBOX file and I couldn't able to find MAC compatible software which can allow me to have access to my crucial data. That time my colleague have recommended remarkable REVOVE MAC MBOX to PST converter tool. Now I am very happy as this tool take me out of the unwanted overheads of installing windows OS back. After using MBOX Convrter I need to share a great experience which I feel since I don't have any separate tool to convert my MBOX file into PST, MSG or EML but MBOX converter really helps a lot while conversion of MBOX files.